OK K.O.! Let’s Play Heroes puts us in the shoes of a young aspiring child named K.O., whom will stop at nothing to become a real hero. K.O’s friends consist of an all-star cast of heroes, from Enid the moody, but cool girl in the front to Rad, the “too cool for school and work” bro that hangs out in the back. 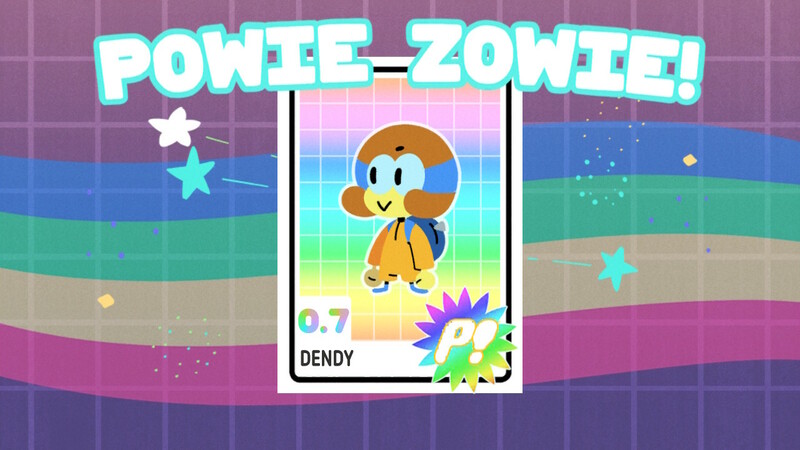 Every real hero in the Plaza has a Pow Card that accurately depicts their current hero level. 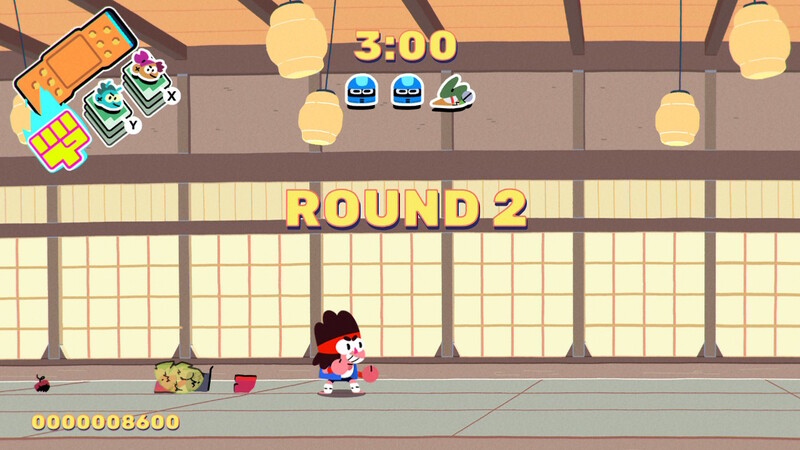 Some are higher than others, and some, like K.O., don’t have any levels at all. In short order, trouble settles over Lakewood Plaza after Lord Boxman resets the card levels of every hero to zero. The Plaza’s fate rests in the hands of one, highly energetic and really, really cool, wannabe hero named K.O. Just Another Hard Day’s Work? OK K.O. progresses along one day at a time. Each day you arrive at Lakewood Plaza, help one of your friends, clock in at the Bodega, help some of your co-workers, clock out, and then head home with mommy. The formula gets quite stale after a while as it all results in K.O. performing more and more fetch quests to advance the story. The storyline and acting keeps the player moving through these tough times, but it is still a test of patience. Make no bones about it, some days literally feel like a job. If it wasn’t for the colorful world of characters I’m not sure how far I would have made it. But in the end, I came for the paycheck and stayed for the friends with epic lines. 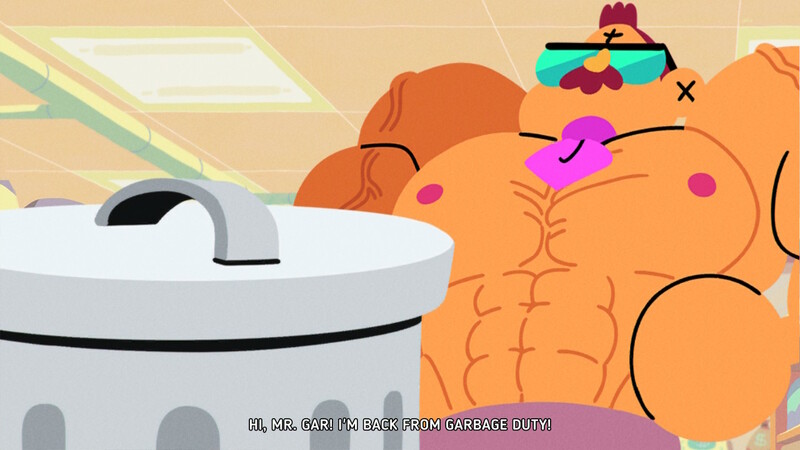 One of the main aspects in OK K.O. are the side-scrolling, beat-em-up battles. Who doesn’t love clocking the bolts out of a bunch of robots?! What makes the battles unique in OK K.O. are the addition of Pow Cards. Pow Cards can be purchased from a dispenser machine within Gar’s Bodega for a small fee. But you can’t bring just any Pow Card into battle. What do you think this is, amateur hour?! 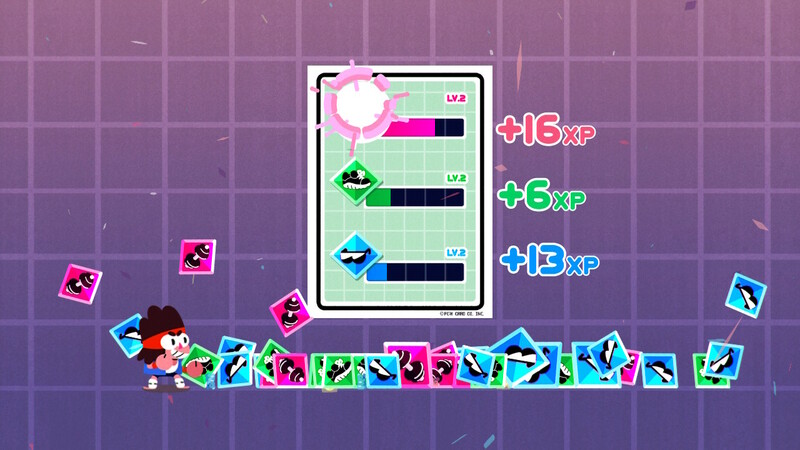 Only Pow Cards whose Powie Zowie you have unlocked will be available to use in battle. These Powie Zowies are unique to each card and can be activated for a cool and, sometimes, devastating attack on an assortment of Lord Boxmore’s robots. After each battle, where you will most obviously win by beating the bolts out of Bowmore’s robots (heroes don’t lose), you get to further beat the stuffing out of a pinata that subsequently spills out skill points in a spectacular fashion. The skills level up screen really unique as I don’t think I’ve ever had to beat my points out of a pinata, ever. This aesthetic fits the rest of the game like a glove. Upgrading your skills will allow you to perform other super cool moves or upgrade the ones you already have obtained. You can even shop around at Beardos or the Bodega for hero-only skill enriching snacks. How do you unlock Powie Zowies? The tried and true fetch quests to the rescue! Only by helping your friends can you regain their Pow Card power levels and eventually unlock their Powie Zowie. Maybe Enid needs some help with her new hit song, or your best bud, Dendy, needs help with the next uber hack shes been working on. Each character will eventually need your assistance in completing a variety of tasks which will eventually result in unlocking their Powie Zowie. K.O.’s cool hero friends often hang out at The Lakewood Plaza, with his closest friends working with him at Gar’s Hero Supply and Bodega. Right around the corner, you will also find local establishments such as the Fitness Dojo, iFrame Outlet, a Burrito stand ran by Beardo, Logic Cuts, and an Arcade. I’ll leave it up to you to explore each of these places but it’s likely a quest or ten will bring you to these locations at some point. There are also a few outside areas such as the back storage room, back alley, and an alleyway full of moody teens. You may even have to take a few trips to Boxmore to duke it out with some robots, or perform some super secret spy maneuvers. There are also a variety of side quests that can be completed around town. While not every character in the Plaza needs your direct help, a small handful do require you to find specific items. Some of these are purchased from the shops while some of them are found only while battling Lord Boxmore’s robots. The arcade has a few games you can play, so make sure to stop by and throw down your quarters to queue for the next play session. OK K.O.! Let’s Play Heroes succeeds in letting us run wild with our inner-youngster hero imagining selves, all the while providing a colorful and fun universe to frolic in till our hearts and souls are full of love. That, paired with an epic level of professional voice acting makes this a game truly worth the Cartoon Network name. But it wouldn’t be OK K.O if a bit of Lord Boxmore didn’t peek through from time to time. For each hero that needs K.O.’s help, there is an accompanying fetch quest! 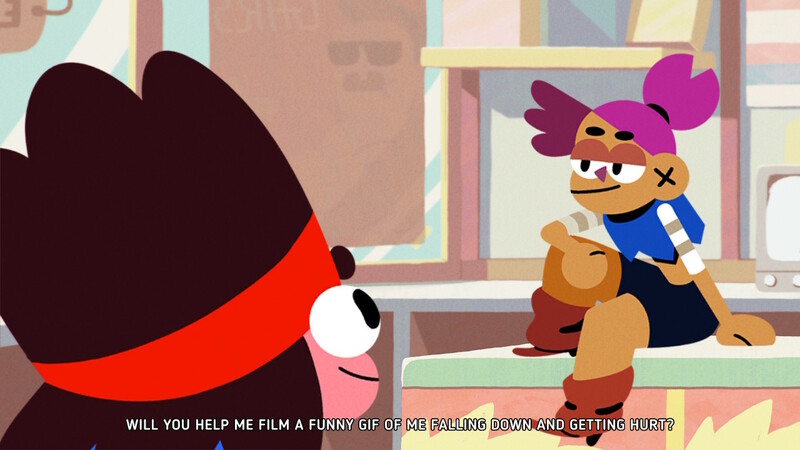 It quickly becomes all too common and somewhat dreaded when your day with OK K.O. largely consists of fetch quest after fetch quest, with some more fetch questing in between talking with your friends and watching the epically directed cut-scenes unfold. The whole OK K.O. package, with all its pieces put together, does work. The story always kept driving me towards the next fetch quest or the next battle scene, eagerly awaiting the next opportunity to punch in at Gar’s Bodega and check on my friends. 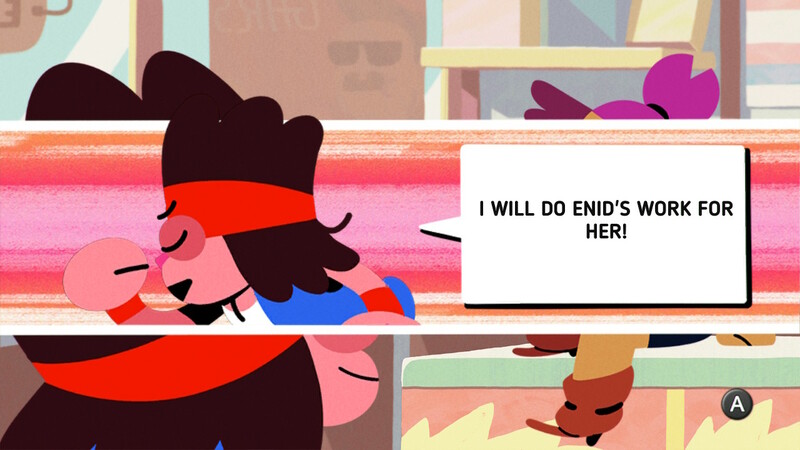 If it wasn’t for the quality of the scenes, the environment, or the characters I have come to admire, I would have abandoned K.O. once the rinse and repeat pattern emerged, however.